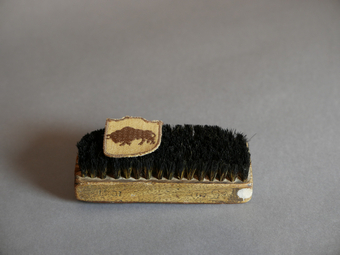 This is my father’s shoe brush, issued to him by the Polish Army in 1942. It is accompanied by his arm-flash, indicating that he was a member of the 5th Division, 8th Army. I found them when moving house, sorting through my mother’s bric-a-brac. They were in the bottom of the shoe box. This painting reminds me of disorientation and fracture. It raises the question, “Can anything return to what it once was?” - the shock realisation that, having lived through war, we can never go back to anything that was familiar. It seems to me that my father’s shoe brush and his arm-flash would have been known, stable objects during that period.